I’m a firm believer in connecting kids with nature through gardening. But who says that connection has to stop during the winter months? 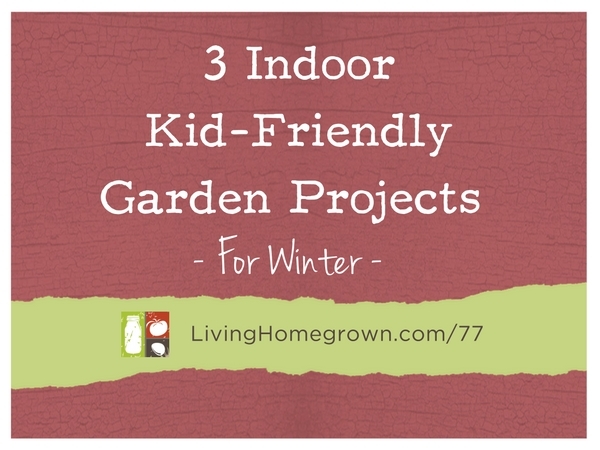 In fact, engaging your kids in small indoor growing projects during the colder months can be more rewarding because the weather may be preventing any outdoor play. A mini garden sitting in the middle of the kitchen table may be all you need to keep that connection strong. Plus, it’s fascinating to watch something grow when you watch it up close. But listen…You don’t need kids to do these projects! We as adults can have just as much fun growing these things ourselves. So you feel free to start one of these projects yourself if you don’t have kids at home. After all – we deserve a connection with nature too!